Clemson Downs strives to provide quality of life services to our residents, in keeping with our top level care we offer In-home Care for our residents. This is a in-home care service designed to provide individualized assistance to those who may otherwise have difficulty maintaining their dignity and well-being. Our staff addresses the issues and solves the problems of the highest priority for our residents and their family. This includes assisting with wellness checks, dispensing of medicines and reminders to take them as scheduled, our trained staff will interpret doctors orders and give peace of mind to family members. 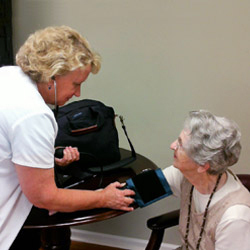 Our In-home Care staff meet strict qualifications to provide the care you need and undergo an individualized assessment prior to assigning them to the resident. We expect the highest standard of professionalism and take pride in the quality and dedication of each of our employees. Billing is minimal and added to your monthly statement. Rest assured, our dedicated team of skilled nurses are there when you need us. Concierge Director, Mrs. Donna Wetherell, RN with resident, Ms. Malinda Holroyd in her Wellness Clinic.